How is the StopRotor aircraft different? Previous attempts to create a stop rotor aircraft have taken two different development paths. The majority of proposals attempting conversion with the aircraft in forward flight. This results in the airflow being aligned with the longitudinal axis of the aircraft and parallel to the rotor disc. Asymmetric airflow created by the forward and retreating blades coupled with the effect of slowing the rotor blades creates instability preventing a successful transition. The second method used are the tail or nose sitter configurations, where the airflow is aligned with the rotation axis of the rotor which is also the longitudinal axis of the aircraft. This configuration means the fuselage is orientated vertically rather than the conventional horizontal aircraft configuration. These configurations have a center of gravity that makes them unstable on the ground with associated issues during takeoff and landing. The fuselage layout limits payload placement and cabin functionality. As yet none of these aircraft have become operational. 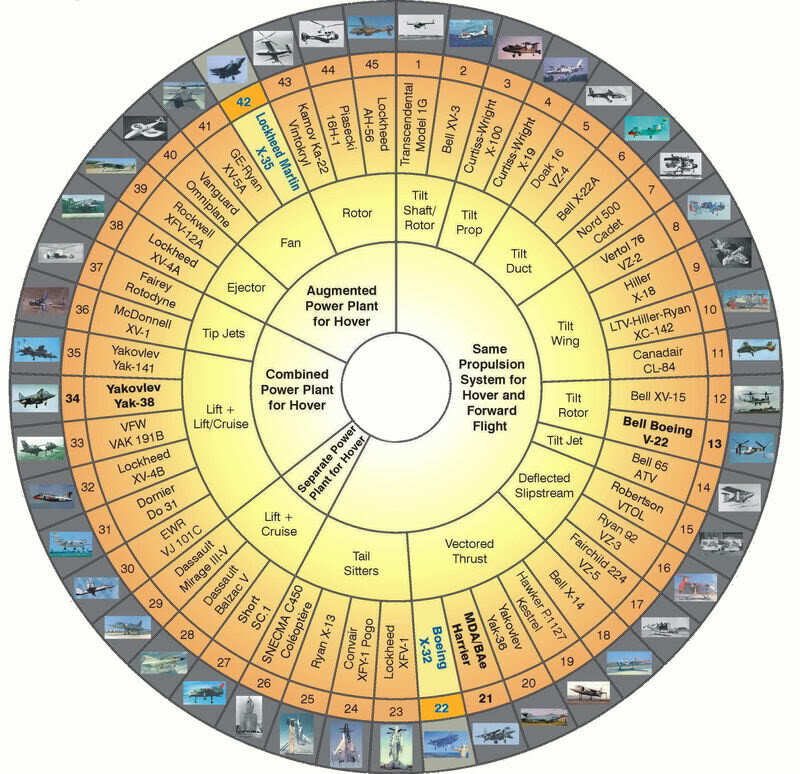 The V/STOL Wheel is a graphic diagram showing some of the many types of vertical and/or short take-off and landing (V/STOL) aircraft that had been built and tested up to 1996.